TheWirk.com ~ voted BallHyped.com's 2010 "Best Independent Sports Blog": Caps, Caps, Caps! ~ What a great couple of games and nights out! Caps, Caps, Caps! ~ What a great couple of games and nights out! 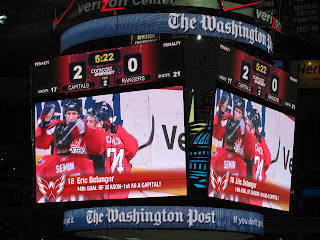 The Caps are back at the Verizon Center and are perfect since the Olympic break. 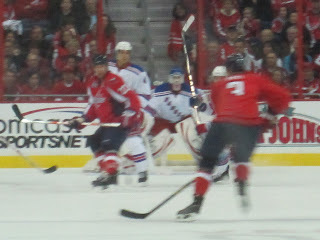 Thursday night, I was lucky enough to take in the Caps game v the Tampa Bay Lightning in one of the Lexus suites thanks to my friend with another technology company. There was an event, and I met a great group of guys. 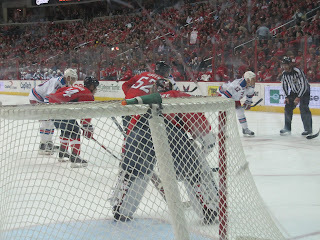 Caps beat the Lightning and it was a great warm-up for a fun night out with new friends. Yesterday, I caught the OT period of the (10) WVU and (9) Villanova game. Great game and WVU pulled off the upset. 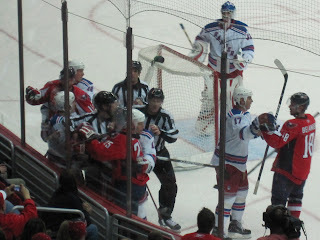 Last night, I had another suite ticket thanks to a friend and took in the Caps v Rangers game. Who doesn't like a free ticket? 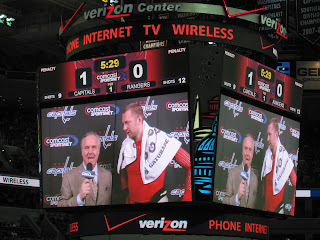 It was the Caps 46th consecutive sell-out game and almost everyone at the Verizon Center was "Rocking the Red". 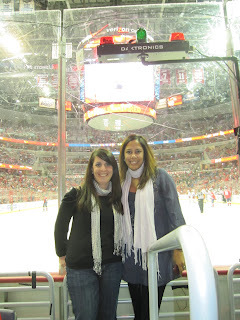 If you haven't been to a Caps game yet, what are you waiting for? The suite is located near the Dunkin Donuts on the concourse, and my sweet tooth was craving some sugar. I left the suite to pick up a couple of donuts and a large iced coffee. Sure enough, within 2 minutes, I was joined by about 7 police officers who told me that, "Cops don't eat donuts," as they patiently waited in line. They were funny. I told my friend about it, and she said I should've snapped a picture for the blog. Shoot ~ she was right?!!? Oh well. Opportunity missed, but something tells me I'll have the chance to do it again. 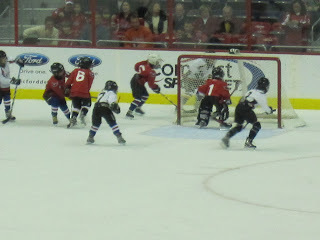 I never really pay attention to the entertainment between the periods, but this time I watched the Mites play. The Mites are the little kids that take the ice and play "lil hockey". They're adorable. One thing that I couldn't help but notice was that the lil goalie had leg pads that were almost as big as him! So cute. Poor lil guy got worked for a hat trick though, by some other kid. I know the kid's name, but am not going to mention it here because he's a kid. Right before the 3rd period, I could heard Amy's name being called in the suite. 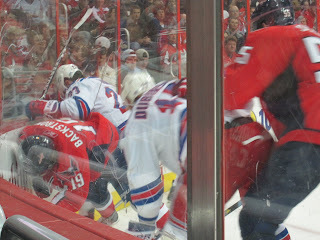 Next thing you know I was told to grab my purse because we were moving down to right behind the goal on the glass!!! What?!?! 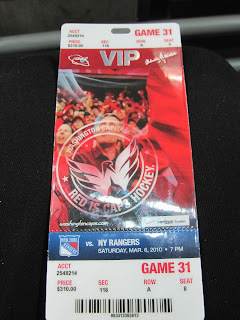 That's right, our sweet, suite seats were being UPGRADED to RIGHT BEHIND THE GOAL, ON THE GLASS!!! Check out the view from the new seats. 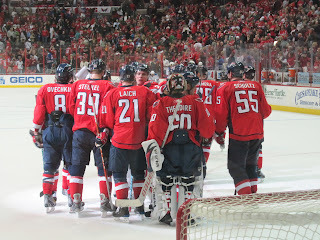 The Caps won the game, 2-0. 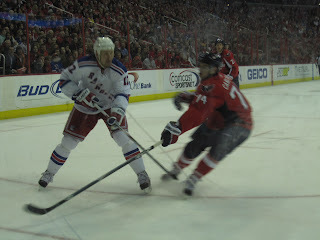 I was thrilled to have such a great fan experience, I actually bought an Ovechkin jersey, while walking along the concourse. This is the first jersey I've ever purchased. Do you have a Caps jersey yet? I guess I've officially jumped on the Caps' bandwagon now ~ but I have to admit, that the Caps are definitely the best show in town!!! Thank you, Caps! What a great night out!!! After the hockey game, we went out to see some friends, and I noticed that Duke was killing UNC at home. The final score was Duke 82, UNC 50. WOW. Here's an exchange I had last night, that still makes me laugh today. What a tough year, for Roy Williams, the Tarheels, Tarheel fans and the ACC... Ouch. Me: Wow. Duke is killing UNC? Friend: Don't watch that. UNC is going to the NIT.